Watch the sky as the sun begins to set and the color changes from blues to oranges. Board a Turn-of-the-Century inspired yacht for a cruise around Boston Harbor! Watch the sky as the sun begins to set and the colors change from blues to oranges. 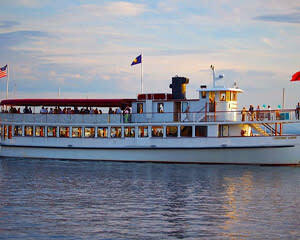 Board a turn-of-the-century inspired yacht for a cruise around Boston Harbor! Your vessel is the Northern Lights, a yacht that measures 110-feet in length along her waterline and expands to a 28-foot beam. She was built with a beautiful mahogany bar, ceiling accents, ceiling trim, and railings. A pass by Fort Independence, taking in views of Boston's Seaport District along the way. Motor under the Tobin Bridge for a different perspective on this iconic landmark. Cruise by the U.S.S. Constitution at dry dock in the Charlestown Navy Yard where your cruise will wait for cannon fire, presented by the US Navy to announce the setting of the sun. Cruise by the North End and catch a glimpse of the Old North Church made famous by the Midnight Ride of Paul Revere. A visit to Boston wouldn’t be complete without a tour of one of the oldest waterfronts in America.